A powerful sense of determination, grit and focus have led the Tech women’s tennis team to a multitude of noteworthy achievements in the past. With a run in the NCAA championship semi-final last spring and an incoming recruiting class ranked No. 6 in the nation this fall, the team is perfectly poised for a strong start for the 2018-2019 season. Last spring ended on a high note for the team: women’s tennis made their first appearance in the Final Four since 2007 and rose as high as No. 2 in the Intercollegiate Tennis Association national rankings. Tech finished with 26-5 overall record, falling only to top-seeded Vanderbilt. A testament to the strength of the program, the Yellow Jackets pushed through some tough competition, battling teams such as No. 3 North Carolina, No. 4 Duke, and No. 7 Georgia and fighting hard on the court to come out on top. Finishing out the season ranked No. 4 by the ITA, it’s safe to say the team is one of the best in the nation. But now the question becomes, how well will the success of last season translate this year? Losing three of four players who powered Tech through to its NCAA semifinalist title last year is quite the blow for the team: Paige Hourigan and Johnnise Renaud reached the end of their NCAA eligibility, and Ida Jarlskog transferred to the University of Florida. However, the team still boasts a selection of great competitors and superb athletes, including veterans and team captains Kenya Jones and Nami Otsuka. Tech’s mixture of experienced upperclassmen and group of talented new recruits means that the chances of the team’s success in upcoming tournaments is high. As the team bid farewell to some key athletes, they welcomed Valeriya Deminova, Baijing Lin and Dalila Said. The three represent one of the top classes in the country, courtesy of tennisrecruiter.net. Because of their past success and highly ranked incoming class, Tech women’s tennis ranks highly both individually and collectively. Jones and Otsuka are nationally ranked No. 44 and No. 108 respectively in ITA singles, and Jones and sophomore Victoria Flores are ranked No. 25 in doubles by ITA. Gearing up to take on top ranked schools such as Georgia and Florida, the team finds themselves with a competitive advantage. Though unable to compete at Duke due to weather related issues, the team is now set to start their fall off at home, with the ITA Southeast Regionals on October 18. Later, the Jackets will see action in Nashville, Tenn. with the June Stewart Invitational starting October 26. Auburn’s invitational, starting November 2, will round out the fall season, and the Jackets are scheduled to start back up again in January by hosting the MLK Invitational, then kick off intercollegiate team matches later that month. The Jackets face a tough team schedule, including away matches against Georgia (ranked No. 8 nationally last season), Miami (No. 15), and Duke (No. 3). Tech also faces off against Texas Tech (No. 14) in their home opener in addition to facing Northwestern (No. 12) and North Carolina (No. 2), before wrapping up with the ACC Tournament in April. 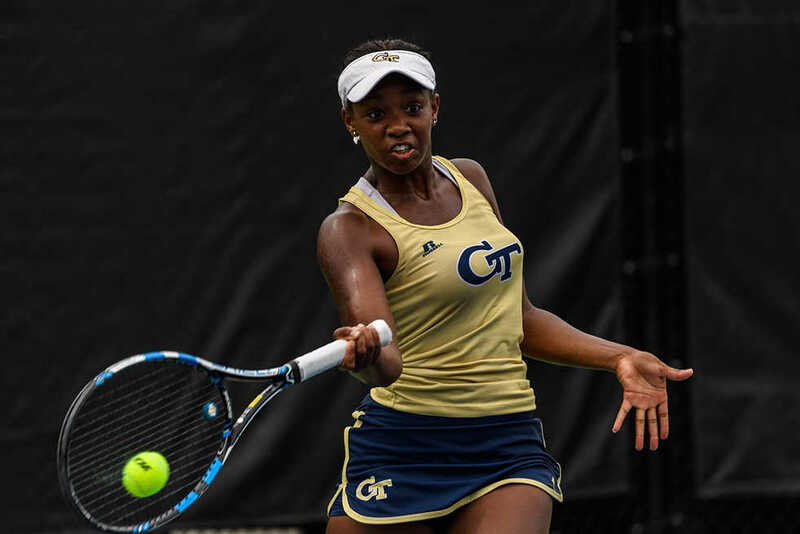 The ACC is arguably the single strongest conference for women’s tennis in the country, leaving a lot of pressure on Tech to keep up the superb performance to hang with the best in their sport. But for the veterans, that pressure is nothing new; a record of not only meeting, but exceeding expectations means the team begins the season with a strong foundation. Part of the team that has always put up a fight, returning Jackets should contribute to their leadership, experience and skill to the team, while the newcomers bring an injection of young blood and talent to the table. This season will likely be one consistently uphill battle, but the women’s tennis team has the right mix of talent and seniority to tackle whatever the season may bring.